I’m back at it with the monthly budget post—this will be the fourth month in a row, woohoo for that! Typically April is a quiet month for me when it comes to clothes shopping. My birthday is at the end of the month (it was Monday), so it’s not usually until May that I go out and do any birthday-money shopping. Without further ado, here’s what I bought. 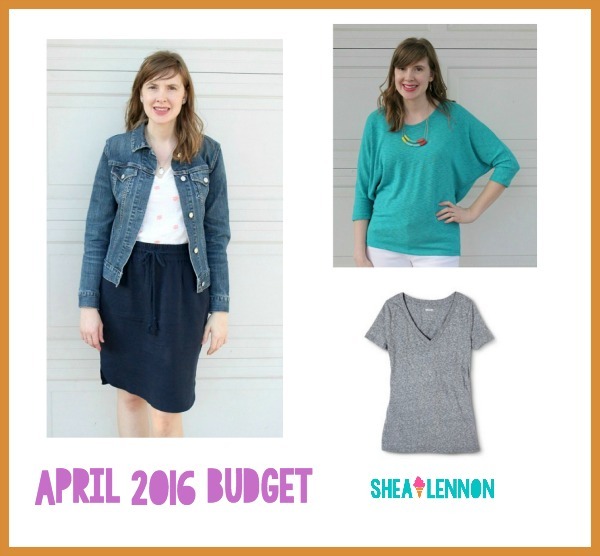 Obviously, the $58 top from Stitch Fix stands out as the priciest item this month. I go back and forth on whether Stitch Fix is worth it for the price, but I usually come to the conclusion that it is. I typically just buy one thing in each fix, I wear everything I’ve gotten consistently, and it helps keep me out of my rut of buying everything at the same two or three stores. Along with the turquoise top, I got some fun basics that I know will get a lot of wear this spring. On next month’s shopping agenda? Maternity clothes and/or clothes that will accommodate a growing middle. Oh, and shoes. 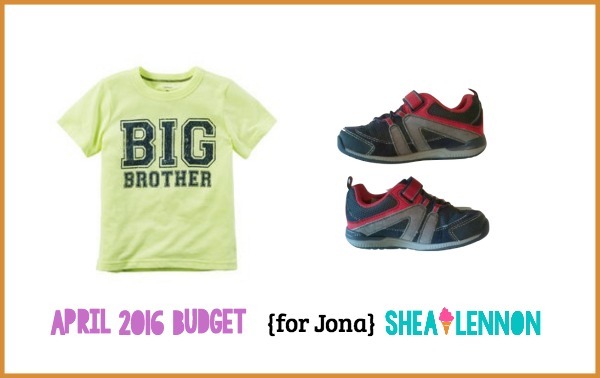 I’ve mentioned before that while I’m pretty thrifty with the rest of his wardrobe, I’m willing to spend a bit more on shoes for Jona. He wears the same one or two pairs to daycare, and with all the running around he does I’d rather have a couple quality pairs than a bunch that will just fall apart. When I hit the outlet shops with my sister-in-law earlier this month, I picked up this pair for him at Stride Rite, a brand I always have good luck with. Jona’s poor closet is still in fall/winter mode, so next month I plan to assess his warm-weather gear to see what still fits, and buy what he needs in the way of short sleeves and shorts. Did you make any fun purchases this month?